On March 13, San Jose State University undergrads met 12 law students visiting from New York’s Columbia Law School. They spent an intense week helping low-income clients with criminal records prepare to have their convictions expunged. This was the sixth year that a contingent of students from Columbia Law School spent their spring break at SJSU. Each year, the visits have been sponsored by the Chinese Law Society. Each SJSU student partnered with a law student to work on behalf of their client. By the end of the week, 12 clients had expungement petitions ready to be filed in court. 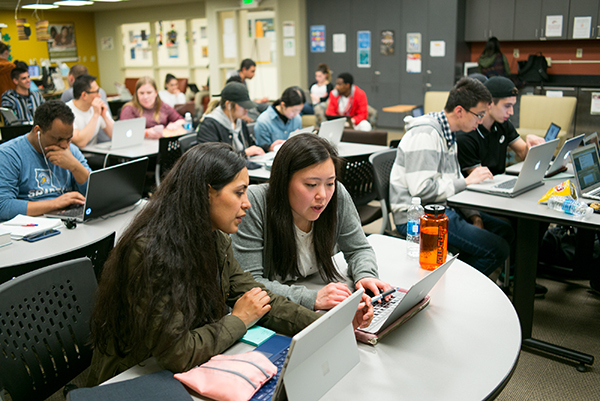 The week is part of SJSU’s Record Clearance Project (RCP), a program in the College of Applied Sciences and Arts Justice Studies Department. Established in January 2008, the RCP provides undergraduates with practical experience working in the justice system while helping people clear their criminal records in court. Peggy Stevenson, RCP director, created the program nine years ago. She and the RCP staff guide students through the process in classes each semester. Angelica Viscarra, a senior justice studies major from SJSU, and Lisa Xia, a second-year law student, were case partners during the week. Their client had been convicted as an accessory to a crime 14 years ago. The client was trying to get it expunged, as she is interested in employment as a caregiver. Xia was thrilled with her week in San Jose. Viscarra is equally enthusiastic about her time with RCP. Indeed, like many of her classmates, she has plans for a career in law. Under attorney supervision, students learn to review rap sheets showing an individual’s convictions, to interview clients during drop-in advice sessions and to prepare petitions seeking expungement for the consideration of a judge. RCP Director Stevenson believes that the RCP is the only program in the country in which undergraduates can take such classes and gain experience providing legal assistance directly to clients. To date, the RCP has filed more than 1,100 petitions in court, with a success rate of 99 percent. Since it requires significant staff assistance to operate, the RCP relies on outside funding, including support from CommUniverCity, grants from Santa Clara County, the city of San Jose, private foundations such as The Health Trust and Castellano Family Foundation, and individual donors.